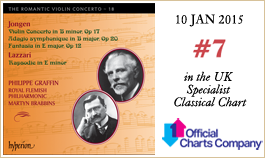 The Romantic Violin Concerto series reaches Belgium and the music of Joseph Jongen, a composer more celebrated for his organ music now, but who was equally admired in his day for his orchestral and chamber works. Jongen studied at the Liège Conservatoire where he heard the great violinist Eugène Ysaÿe and composer-conductors Vincent d’Indy and Richard Strauss. 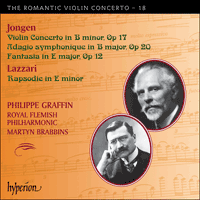 In this new album Philippe Graffin (a welcome and familiar presence in this series) collaborates with the Royal Flemish Philharmonic and Martyn Brabbins in Jongen’s Violin Concerto, one of the composer’s first substantial works. It was described by his contemporary Florent Schmitt as ‘one of the finest violin concertos’; and he admired the ‘outpouring of warm lyricism’ and ‘lush profusion of themes and rhythms’. Also included are other works for violin and orchestra, and a Rapsodie for the same forces by Italian Romantic Sylvio Lazzari (1857–1944) who was influenced—as was Jongen—by the music of César Franck. In a biographical pamphlet published by J & W Chester in 1922, Lord Berners described Joseph Jongen as a composer whose music had ‘remarkable lyric charm and dramatic power’. That acute summary of his musical language makes his neglect all the more puzzling. If Jongen is known at all, it is largely through his finely crafted organ music, rather than his substantial output for orchestra or his chamber music (including three fine string quartets). Born in Liège on 14 December 1873, his father was a cabinet-maker and wood-carver who specialized in church furnishings. But he was also a keen amateur musician (he had studied the trombone in his youth), who had encountered the best music Paris had to offer when he spent six months there in 1867. Jongen began to study the piano when he was seven years old, and his teacher (who was organist of Saint-Jacques in Liège) soon encouraged him to take up the organ as well. Jongen continued his studies at the Conservatoire in Liège while still singing in the choirs of several churches. His time at the Liège Conservatoire was formative, with his first chance to hear Eugène Ysaÿe, and visits to the city by composer–conductors such as Vincent d’Indy and Richard Strauss. Jongen was a brilliant student and had already started to demonstrate his gifts as a composer in his early teens. In 1897 he won the Belgian Prix de Rome, which gave him the chance to study in Italy and to travel. He made the most of this opportunity, setting out first for Berlin in 1898, where the concerts conducted by Arthur Nikisch and Felix Weingartner made a lasting impression, as did performances of Strauss’s Heldenleben (conducted by the composer) and Jongen’s first hearing of Brahms’s Violin Concerto, played by Joseph Joachim. One of his grandest works from this period was a symphony, written under the influence of Strauss’s tone poems. He took it to Strauss and was delighted to be welcomed warmly and taken seriously, recalling later that Strauss’s comments were ‘like beams of light, as if a thick curtain had been lifted from my eyes’. This concerto, which, they say, dates from the 1900s, wears its age lightly, and if the initial part seems to delight in a slightly stiff dignity, it is the hesitant shyness of a personality that is still looking, however, towards the Andante—more matured, blended with delicious melancholy, an outpouring of warm lyricism. Schmitt’s comments on the first movement are fair enough: though there is plenty of florid solo writing, the mood is dominated by the rather stern opening figure, descending, then rising on a dotted rhythm, that suggests something of Jongen’s debt to César Franck (he was still in his mid-twenties when he composed this concerto). A contrasting theme in E major shows another Franck characteristic—returning repeatedly to one or two notes around which the whole melody seems to revolve. As Schmitt suggests, it is in the slow movement (not in fact an ‘Andante’ but marked Adagio, molto espressivo) that Jongen appears to be set free with song-like lines for the soloist often seeming to spiral upwards, and orchestration that is delicately coloured for the most part, blossoming into a big tutti just once, near the end. This concerto, which I believe was previously unknown in France, may be among the finest violin concertos, advantageously replacing, if necessary, the interesting but hackneyed Mendelssohn, and even more so that of Beethoven which is completely devoid of any actual musical interest. The Violin Concerto was one of Jongen’s first substantial works. During his stay in Paris in he composed the Adagio symphonique in B major, Op 20, completing it in April 1901 (the manuscript is dated) and dedicating it to his friend Joseph Debroux (1866–1929), with whom he produced some editions of little-known eighteenth-century music. Beginning with a haunting horn figure that comes to dominate much of the work, the violin soloist plays high-lying lyrical lines over quite a rich orchestral texture. Towards the end, the soloist engages in a brief but lovely dialogue with solo oboe and flute before the music turns to harp-drenched chords of B major, with hints of the opening theme beneath. The Fantasia in E major, Op 12, is the earliest work on this recording, completed in October 1898, just before Jongen began his European travels. A short piece, it begins slowly before becoming more animated. The most memorable moment comes near the end, where the soloist plays a version of the main theme notable for its uncomplicated lyricism, Jongen’s confident handling of the orchestra, and his gift for telling harmonies. Sylvio Lazzari (1857–1944) was born in Italy. A pupil of Gounod at the Paris Conservatoire, he was encouraged by Franck and Chausson and his music owes a considerable debt to them, as well as to Wagner. He is probably best known for the opera La tour de feu (The lighthouse), given its premiere at the Paris Opéra in 1928. It was one of the first operas to make use of cinema effects (the final scene was performed in front of a projected film of a stormy sea). The Rapsodie in E minor for violin and orchestra was composed six years earlier (the manuscript is dated ‘Suresnes, 16 April 1922, Easter Sunday’). The fluid harmonies and lyrical lines of this work reveal a composer of great skill, while the solemn chromatic brass chords that introduce the closing section suggest a flair for moments of post-Wagnerian nobility. Cast in a single movement, the Rapsodie has an appropriately free structure—and one that is marked throughout by music of singular beauty and poise, deftly orchestrated. Dans une brochure biographique parue chez J. & W. Chester en 1922, Lord Berners prêta à la musique de Joseph Jongen «un charme lyrique et une puissance dramatique remarquables». Ce résumé pénétrant rend d’autant plus surprenant l’oubli dans lequel ce compositeur a sombré. Quand les gens le connaissent, c’est bien plus pour sa musique d’orgue finement ciselée que pour sa large production orchestrale ou pour sa musique de chambre (dont trois beaux quatuors à cordes). Il naquit à Liège le 14 décembre 1873, d’un père ébéniste et sculpteur sur bois (spécialisé dans le mobilier d’église), mais aussi fervent musicien amateur, qui avait étudié le trombone dans sa jeunesse et découvert, durant six mois de l’année 1867 passés à Paris, la meilleure musique que la capitale avait à offrir. Jongen commença le piano à sept ans et son professeur (organiste de Saint-Jacques, à Liège) l’encouragea bientôt à se mettre à l’orgue. Il poursuivit ses études au Conservatoire de Liège, sans cesser de chanter dans divers chœurs d’église. Pendant ses formatrices années de Conservatoire, il eut la chance d’entendre pour la première fois Eugène Ysaÿe et, lors de leur passage à Liège, des compositeurs–chefs d’orchestre comme Vincent d’Indy et Richard Strauss. Élève brillant, Jongen montra des talents de compositeur dès sa prime adolescence. En 1897, il remporta le prix de Rome belge, qui lui permit d’aller étudier en Italie et de voyager. Une possibilité qu’il exploita à fond: en 1898, il se rendit d’abord à Berlin, où les concerts dirigés par Arthur Nikisch et Felix Weingartner l’impressionnèrent durablement, tout comme les représentations de Heldenleben (sous la baguette de Strauss en personne) et la découverte du Concerto pour violon de Brahms, sous l’archet de Joseph Joachim. L’une de ses plus grandes œuvres fut alors une symphonie rédigée sous l’influence des poèmes symphoniques de Strauss, à qui il la montra. Ravi d’avoir été accueilli chaleureusement et pris au sérieux, il se rappellera que les remarques de Strauss avaient été «comme des traits de lumière, comme un lourd rideau qui se soulevait devant [ses] yeux». Ce concerto qui, dit-on, date des années 1900, porte allègrement son âge, et si la partie initiale semble se complaire dans la dignité un peu compassée, la timidité hésitante d’une personnalité qui se cherche encore, en revanche, l’Andante, plus mûri, mêle à une délicieuse mélancolie l’effusion du plus chaleureux lyrisme. Ce que Schmitt dit du premier mouvement est assez juste: malgré une abondante écriture solo fioriturée, le climat est dominé par la figure liminaire assez austère, qui descend puis monte sur un rythme pointé, suggérant comme une dette envers César Franck (Jongen n’avait encore que dans les vingt-cinq ans quand il composa ce concerto). Un thème contrastif en mi majeur trahit un autre tour franckiste—revenir sans cesse à une ou deux notes autour desquelles toute la mélodie semble se résoudre. Comme le suggère Schmitt, c’est dans le mouvement lent (en réalité, ce n’est pas un «Andante» mais il est marqué Adagio, molto espressivo) que Jongen se montre prodigue de lignes chantantes pour le soliste, qui paraît souvent monter en spirale, et d’une orchestration toute en coloration subtile, qui s’épanouit en un gros tutti une seule fois, vers la fin. Le finale, au début si pénétrant en ses sixtes ascendantes de quatuor et à la fin si brillante, explose en une luxuriance de thèmes et de rythmes qui va jusqu’à la prodigalité. Ce concerto qui, je crois bien, était jusqu’alors inconnu en France, peut compter parmi les beaux concertos de violon, remplaçant avantageusement, le cas échéant, celui, intéressant certes, mais tant ressassé de Mendelssohn, et mieux encore celui de Beethoven complètement dépourvu, lui, de tout intérêt proprement musical. Avec ce Concerto pour violon, Jongen composa l’une de ses premières œuvres substantielles. À Paris, il écrivit l’Adagio symphonique en si majeur, op.20, achevé en avril 1901 (le manuscrit est daté) et dédié à son ami Joseph Debroux (1866–1929), avec qui il produisit des éditions de musiques méconnues du XVIIIe siècle. Partant sur une lancinante figure de cor qui finit par dominer une large part de l’œuvre, le violoniste solo exécute des lignes vivement lyriques par-dessus une richissime texture orchestrale. Vers la fin, le soliste se lance dans un court mais charmant dialogue avec un hautbois et une flûte, puis la musique passe à des accords de si majeur aux accents harpés avec de sous-jacentes allusions au thème inaugural. La Fantaisie en mi majeur, op.12, la plus ancienne œuvre de cet enregistrement, fut terminée en octobre 1898, juste avant que Jongen ne parcourût l’Europe. Brève, elle démarre lentement, puis s’anime. Le moment le plus mémorable survient vers la fin, quand le soliste joue une version du thème principal valant par son lyrisme sans apprêts, par son traitement orchestral maîtrisé et par le don de Jongen pour les harmonies éloquentes. Sylvio Lazzari (1857–1944) naquit en Italie. Élève de Gounod au Conservatoire de Paris, il fut encouragé par Franck et par Chausson, envers qui sa musique a une dette immense, tout comme envers Wagner. Peut-être est-il surtout célèbre pour son opéra La tour de feu, créé à l’Opéra de Paris en 1928. Ce fut l’un des premiers opéras à utiliser des effets cinématographiques (la scène finale fut interprétée devant un film montrant une mer déchaînée). La Rapsodie en mi mineur pour violon et orchestre fut composée six ans plus tôt (le manuscrit porte la mention «Suresnes, le 16 avril 1922. Dimanche de Pâques»). Les harmonies fluides et les lignes lyriques révèlent un compositeur très habile, cependant que les solennels accords chromatiques qui introduisent, aux cuivres, la section conclusive, suggèrent un don pour des moments de majesté postwagnérienne. Coulée en un seul mouvement, cette Rapsodie a une structure opportunément libre, marquée de bout en bout par une musique singulièrement belle et posée, adroitement orchestrée. In einem von J & W Chester veröffentlichten biographischen Aufsatz von 1922 wird Joseph Jongen von Lord Berners als ein Komponist beschrieben, dessen Musik „bemerkenswerten lyrischen Charme und dramatische Kraft“ besaß. Diese scharfsinnige Charakterisierung seiner musikalischen Sprache lässt die Vernachlässigung seines Oeuvres umso rätselhafter erscheinen. Wenn der Name Jongen überhaupt geläufig ist, so wird er überwiegend mit seiner feingearbeiteten Orgelmusik in Verbindung gebracht, und nicht so sehr mit seinem beträchtlichen Korpus an Orchester- und auch Kammermusik (worunter sich etwa drei sehr schöne Streichquartette befinden). Er wurde am 14. Dezember 1873 in Lüttich als Sohn eines Tischlers und Holzschnitzers geboren, der sich auf Kirchenmobiliar spezialisiert hatte. Jongen Senior war jedoch auch ein passionierter Laienmusiker (in seiner Jugend hatte er Posaune gelernt), der mit der besten Musik in Berührung gekommen war, die Paris zu bieten hatte, als er dort im Jahre 1867 sechs Monate verbrachte. Sein Sohn erhielt ab dem Alter von sieben Jahren Klavierunterricht und sein Lehrer (der Organist der Jakobskirche in Lüttich) ermutigte ihn bald dazu, auch Orgel zu lernen. Später besuchte Jongen das Konservatorium in Lüttich und sang gleichzeitig in mehreren Kirchenchören. Es war dies eine prägende Phase für ihn, in der er zudem erstmals Eugène Ysaÿe hörte und Künstler wie Vincent d’Indy und Richard Strauss erlebte. Jongen war ein brillanter Student und bewies bereits in jungen Jahren Kompositionstalent. 1897 wurde ihm der belgische Prix de Rome verliehen, der ihm ein Studium in Italien ermöglichte und es ihm zudem erlaubte, Reisen zu unternehmen. Diese Gelegenheit machte er sich zunutze und fuhr 1898 zunächst nach Berlin, wo Konzerte unter der Leitung von Arthur Nikisch und Felix Weingartner großen Eindruck auf ihn machten. Aufführungen des Heldenleben von Strauss (unter der Leitung des Komponisten) sowie des Violinkonzerts von Brahms, gespielt von Joseph Joachim, waren ebenfalls prägend für Jongen. Von den Werken, die er in dieser Zeit komponierte, war eine Symphonie besonders gewaltig, deren Inspirationsquelle Strauss’ Tondichtungen waren. Er legte sie Strauss vor und freute sich darüber, herzlich begrüßt und ernst genommen zu werden—später erinnerte er sich daran, dass Strauss’ Kommentare wie „Lichtstrahlen [waren], als ob ein schwerer Vorhang vor meinen Augen aufgezogen würde“. Dieses Konzert, welches, wie es heißt, aus den 1900er Jahren stammt, zeigt sein Alter kaum, und wenn der erste Teil gediegen und etwas steif anmutet, so zeigt sich im Andante ein schüchternes Zögern—ein warmer, lyrischer und reifer Satz, der von einer wunderbaren Melancholie durchzogen ist. Schmitts Einschätzung des ersten Satzes ist zutreffend: obwohl hier durchaus ausgeschmückte Solopassagen erklingen, wird die Stimmung von der recht strengen Anfangsfigur beherrscht, die zunächst abwärts gerichtet ist und dann auf einem punktierten Rhythmus wieder aufsteigt, was im Stil an César Franck erinnert (Jongen war erst Mitte Zwanzig, als er dieses Konzert komponierte). Ein kontrastierendes Thema in E-Dur zeigt ein weiteres Charakteristikum Francks auf—er kommt wiederholt auf einen, beziehungsweise zwei Töne zurück, um die die gesamte Melodie kreisen zu scheint. Wie Schmitt anmerkt, ist es dann im langsamen Satz (der allerdings nicht als „Andante“, sondern als Adagio, molto espressivo) bezeichnet ist, wo Jongen sich mit liedartigen Melodien für den Solisten, die sich oft nach oben zu schrauben scheinen, befreit; dazu erklingt ein zumeist behutsam eingefärbter Orchestersatz, der nur einmal, kurz vor Ende, in ein großes Tutti aufblüht. Das Finale ist zu Beginn durch die aufsteigenden Sexten in den Streichern sehr eindringlich und dann strahlend gegen Ende, wenn sich eine wahrhaftige Explosion üppiger Themen und Rhythmen vollzieht. Dieses Konzert, das, soweit ich weiß, bisher in Frankreich unbekannt war, darf zu den schönsten Violinkonzerten gezählt werden und kann als vorteilhafter Ersatz des zwar interessanten, jedoch abgedroschenen Mendelssohn dienen, und umso mehr des Beethoven, dem jegliches musikalische Interesse fehlt. Das Violinkonzert war eines von Jongens ersten großangelegten Werken. Während seines Paris-Aufenthalts komponierte er das Adagio symphonique in H-Dur, op. 20, welches er im April 1901 (das Manuskript ist datiert) fertigstellte und seinem Freund Joseph Debroux (1866–1929) widmete, mit dem er mehrere Editionen kaum bekannter Werke des 18. Jahrhunderts angefertigt hatte. Das Stück beginnt mit einer eindringlichen Horn-Figur, die dann große Teile des Werks dominiert; die Solovioline spielt hochliegende lyrische Passagen über einem üppigen Orchestersatz. Gegen Ende findet ein sehr schönes, wenn auch kurzes Gespräch zwischen dem Soloinstrument sowie Solo-Oboe und Flöte statt, bevor die Musik sich Harfen-durchtränkten H-Dur-Akkorden zuwendet, die unter der Oberfläche auf das Anfangsthema hinweisen. Die Fantasia in E-Dur, op. 12, das früheste Werk der vorliegenden Einspielung, wurde im Oktober 1898 fertiggestellt, kurz bevor Jongen sich auf seine Reisen durch Europa begab. Es handelt sich dabei um ein kurzes Stück, das langsam beginnt und dann animierter wird. Der denkwürdigste Augenblick kommt gegen Ende, wo der Solist eine Version des Hauptthemas spielt, das aufgrund seiner unkomplizierten Lyrik und Jongens selbstbewusster Behandlung des Orchesters sowie seiner besonderen harmonischen Gabe bemerkenswert ist. Sylvio Lazzari (1857–1944) wurde in Italien geboren. Am Pariser Conservatoire war er ein Schüler Gounods; zudem wurde er von Franck und Chausson ermutigt und seine Musik weist deutliche Parallelen zu dem Oeuvre dieser beiden Komponisten und auch zu Wagner auf. Sein wohl bekanntestes Werk ist die Oper La tour de feu (Der Leuchtturm), die 1928 an der Pariser Opéra uraufgeführt wurde. Hierbei wurde auf der Opernbühne mit zum ersten Mal von kinematographischen Effekten Gebrauch gemacht (die letzte Szene wurde vor einem projizierten Film einer aufgewühlten See dargeboten). Die Rapsodie in e-Moll für Violine und Orchester war sechs Jahre zuvor entstanden (das Manuskript trägt den Vermerk „Suresnes, den 16. April 1922. Ostersonntag“). Die flüssigen Harmonien und lyrischen Linien dieses Werks offenbaren einen äußerst talentierten Komponisten, während die feierlichen chromatischen Bassakkorde, mit denen der Schlussteil des Werks eingeleitet wird, ein Flair für Momente post-Wagnerischer Nobilität andeuten. Die Rapsodie ist einsätzig angelegt und hat eine entsprechend freie Struktur, die sich zudem durchgehend durch eine Musik von einzigartiger Schönheit und Ausgeglichenheit mit gewandter Orchestrierung auszeichnet.